Project obstacles and solutions: A new Love's Travel Stop was being constructed along I-70 in Knightstown, Indiana. The truck and auto fueling center required considerable prep work to accommodate its large fueling systems, truck service center, truckers' lounge, showers, store and restaurant. The elevation for this site was low and had a problem with water. The water problem had to resolved before any other construction could take place. This was impacting the schedule. IMI Aggregates was contacted to supply stone for the project. After examining the condition of the soil, IMI geologists suggested that Specialties Company be brought in to lime stabilize the soil. After the lime was tilled in the soil, it took care of the water problem and provided a solid subsurface base. This was covered with sand and a geosynthetic grid. IMI Aggregates then supplied 20,000 tons of stone for the subsurface. DJ Denger leveled and compacted the stone before concrete and asphalt paving took place. Hardcrete did all of the concrete paving on the service bays, approaches and sidewalks. E&B Paving completed all of the curbs and asphalt paving. 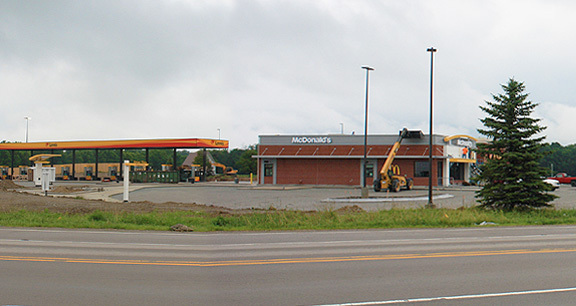 Love's Knighstown location opened for business on July 23, 2015. For more information on aggregate solutions in your area, click here. For more information on soil stabilization materials from IMI, click here. For information on soil stabilization from Specialties Company, click here.